Since 1998 the Chevrolet Spark has been a part of the GM lineup—at least in spirit. For more than a decade, the Spark rolled out under different names in Asia and Europe. The first generation ran from 1998 to 2001, with the second generation in production from 2005 to 2010. The third generation was the first to appear in the United States, with production beginning in 2012, although the 2013 model year was its first official year. The Spark, a “city car,” is premised on efficiency and built for short distances between Point A and Point B. Instead of power, it offers fuel economy. Instead of sporty handling to zip around curves, it offers a low base price. Practical considerations include four doors and a design with cargo room, not aerodynamics, at top of mind. Many of the Spark’s features intend to lure a younger audience and are on the inside. Its interior design and plug-and-play technology connections seek to atone for the aforementioned lack of zip—until the 2016 model, the Spark was stuck with a horsepower rating in the 80s. The horsepower jump into the 90s still falls below most competitors but reflects GM’s understanding that, when you’re in your car each and every day, there is real value in the response you get when you punch the accelerator. The Spark EV, available in certain areas, is an all-electric version of the economical vehicle. Often, car buyers focus primarily on horsepower. But there’s a related and important metric: torque. Here’s why torque matters. Torque tells more of the story than horsepower, and a more critical one when looking for a small, sporty vehicle. In short, torque is all about acceleration and handling—the factors that make drivers fall in love with a car and the way it feels behind the wheel. Consistently, the FIAT 500 has proven a sharper handler, even after the Chevrolet Spark’s recent power upgrade. Make sure you love what you drive, and how it drives. So does saving on initial cost and gas make sense in the long run? And how should you compare the Chevrolet Spark against competitors? 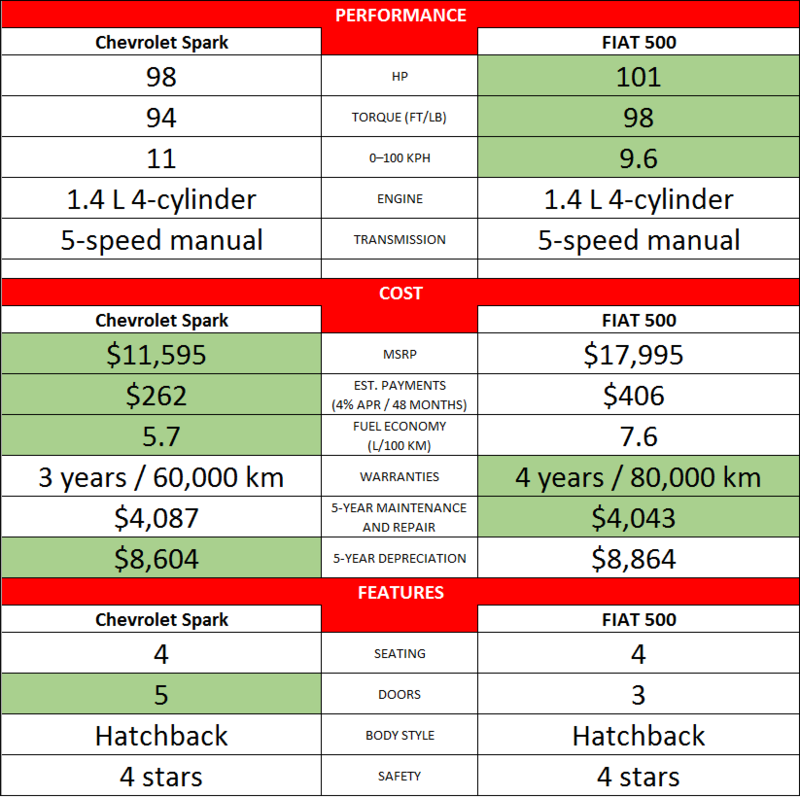 That depends on what’s most important to you, but here’s a glimpse at how the Chevy Spark stacks up against the FIAT 500.